This is definitely a messy activity, so have some towels on hand to soak up all the liquid. I did this activity with R seated in her high chair so that I could easily clean up afterwards with R out of the way. If you are concerned about the mess, it’s just as fun to do the activity outdoors! a. Art Project. I saw this extension idea put out by Misty over at Motley Toddler and had to share it! Place the food colouring and baking soda onto one tray instead of separate cups. Have the child add vinegar using a medicine dropper to make more contained eruptions. Once the colourful eruptions subside, place a piece of construction paper or water-colour paper on top to create printed paper. b. Scientific Testing. 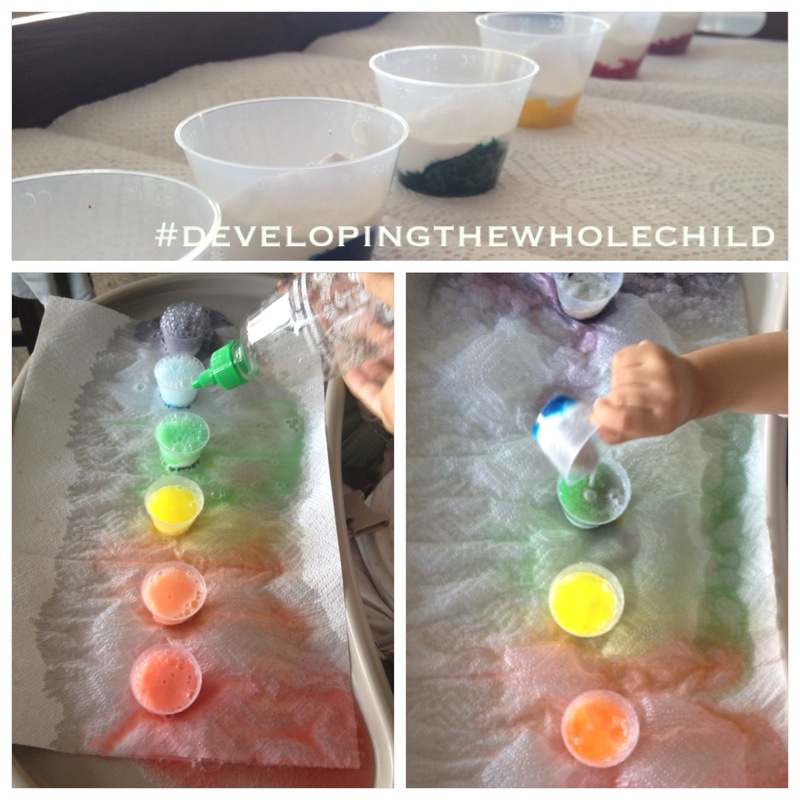 With an older child, explore what happens with vinegar is combined with other household powders (such as baking powder or corn starch). Have him/her record his/her observations in a science journal. We will definitely give this a try! For anyone who finds their little one dyed with food colouring, as I once did, shaving cream is the best way to remove it ASAP! Great suggestion! I tried it out and it worked wonderfully to remove stains! Would love to see how they do with it! If you post it, send me the link!